Check it off your bucket list. 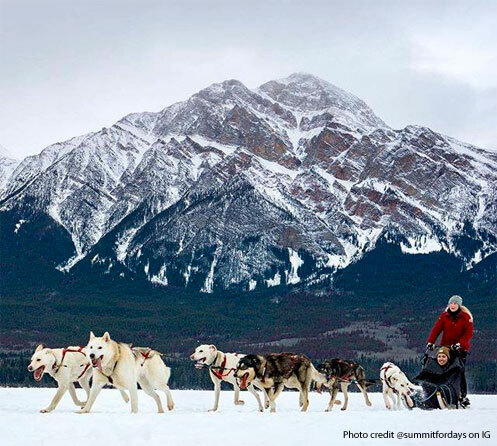 Silently MUSH across Jasper National Park's frozen Pyramid Lake upon Canada's oldest form of winter transport: dog sledding. What better way to capture the majestic panoramic views of the Canadian Rockies than behind a team of enthusiastic and friendly Alaskan Huskies. Rides from 11am - 3pm on January 12, 20 & 26, 2019 are first come first served. Parking is only available at Jasper Riding Stables. Shuttle will run from the Stables to Pyramid Lake and back and payment can only be made by CASH. Cost is $40 per adult, $20 per child (age 1-12) and Children under 1 ride for FREE. All youth under the age of 18 must be accompanied by an adult. Rides are approx. 10 minutes. See you on the Lake! BC Dog Sled Tours in the Rocky Mountains just a short, scenic drive from Jasper National Park, Jasper, Alberta. Dog Sledding Tours to suit all ages - Singles - Couples - Families - Groups. Are You a Driver? Or are you a Passenger? "We guarantee you won't be able to wipe the smile off your face!"